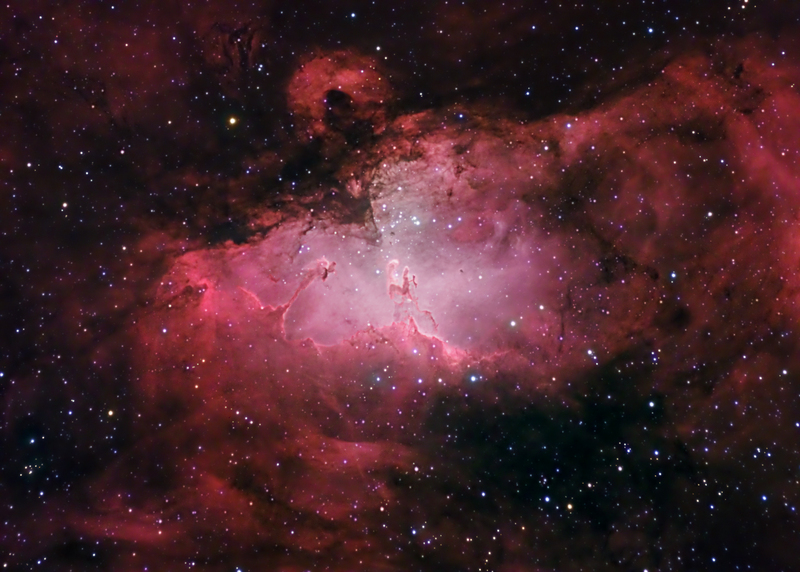 The Eagle Nebula (also known as M16 and NGC 6611) is a young open cluster of stars in the constellation Serpens. The "Eagle" refers to visual impressions of the dark silhouette near the center of the nebula, an area made famous as the "Pillars of Creation" photographed by the Hubble Space Telescope. The nebula contains several active star-forming gas and dust regions, including the Pillars of Creation. This region of active star formation is about 7,000 light years distant. The spire of gas that can be seen coming off the nebula is approximately 9.5 light years or about 90 trillion kilometers long. The cluster associated with the nebula has approximately 8,100 stars. The cluster's age is estimated to be 1–2 million years.